Between shooting for clients, teaching my kids photography class, family obligations, and all of the non-photography activities essential to running a photography business, Life has a way of not letting me shoot just for me very often. 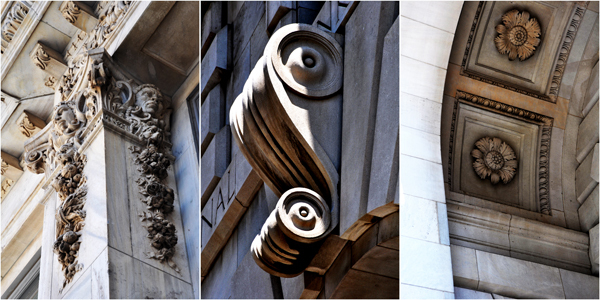 So, when I do get a chance to get out and shoot for myself, I find that I gravitate to architectural subjects. I live pretty close to a busy downtown area with a lot of history, so there’s never any shortage of interesting buildings to photograph. 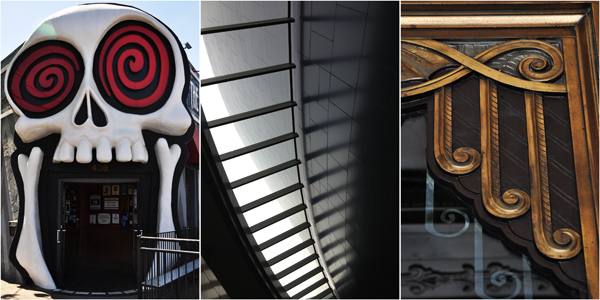 Much has been written about the technical aspects of architectural photography. Everything from perspective-correcting tilt-shift lenses to reflection-reducing polarizing filters have been suggested by some of the best in the business for capturing compelling images of buildings big and small. Don’t fall into the trap, though, of thinking that you need lots of expensive accessories to take interesting architectural photos. Architectural photography, like every other genre, has its share of cliches, and I’ve probably shot them all. Skylines? Check. Laying down on the sidewalk and shooting straight up the side of the city’s tallest building? Check. So, if you believe (as I mostly do) that there is no such thing as an original idea, how do you capture something original and unique? Step #1 is to not care whether somebody else has taken a similar photo before you. If it’s original to you and you like it, then go with it. Print it big and hang it proudly. But if you’re still looking for an original, unique perspective, start concentrating less on the big picture and more on the details. 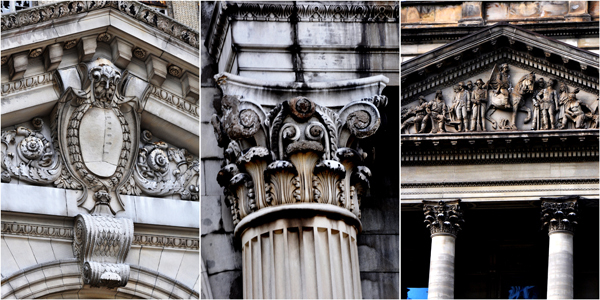 Older buildings like these in Detroit offer a wide variety of textural and structural components to photograph. You’ve heard the old line about the whole being greater than the sum of its parts. It’s the theory that something grand and impressive can result from the combination of less significant components. What you may not have heard is that the opposite can be just as true. Depending on your lens, vantage point, available lighting, and a host of other variables, it is entirely possible– if not likely– that an entire building would appear so small in the frame that whatever drew you to it in the first place could be lost and overlooked in the actual photo. Also, light that might be perfect for windows, doorways, and other details could be completely unsuitable for capturing the detail and character of the building as a whole. 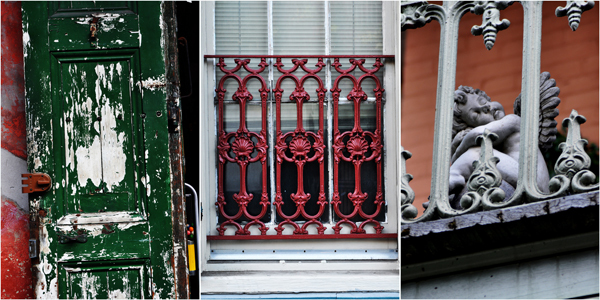 The French Quarter in New Orleans is a treasure trove of distinct architectural elements. As photographers, we strive to put our personal stamp on every image. Every picture tells a story. Architects are no different, imprinting style, history, and textures into their work. They are easy to find. Just take a step back and look for the parts that make up the whole. As with any other type of photography, concentrate on angles, composition, and lighting. As far as selecting the right lens? Just like photographing portraits, landscapes, food, or any other subject, your ideal focal length is going to depend on the size of the subject and your proximity to it. If, for instance, you are photographing gargoyles several stories above the ground, a long zoom of at least 200-300 mm is a must. On the other hand, if you are photographing a doorway, you’ll definitely need a wide angle of 28mm or wider. Three of my favorite Atlanta doorways. Going for bigger details will require a wide angle lens. Beware of some of the common pitfalls. Even though you are not photographing the entire building, you still have to be careful about tilting your camera back too far and causing distortion. When you tilt back to look up at a building through your camera, the bottom of the sensor is closer to the building that the top of the sensor, resulting in an image where the top of the building looks considerably more narrow than the bottom. While you won’t encounter this issue too often while photographing details, you still need to be aware of it. Also watch out for reflections in windows and glass doors. Sometimes, slightly shifting your angle so you are not shooting at a direct 90-degree angle to the glass can correct the problem (and keep your own reflection out of the photos). One last note on safety and choosing your buildings carefully. In this post-9/11 world–particularly in the United States– there are security issues to be considered. If you are photographing a government building, for example, do not be surprised to find yourself in a discussion with armed security guards within moments of taking your shot. While you are legally and technically allowed to take photos of public buildings from public vantage points, this does not always apply to federal office buildings, courthouses, and banks. Be polite. Don’t argue. If asked for your ID, provide it. Be prepared to delete the images on the spot. I’ve run into this issue a few times with non-governmental buildings also. I was once photographing the office building where I practiced law in another life, when I was approached by two very large men who were demanding to know what I was doing. I was not doing anything illegal or even anything for which they had the right to detain or question me. In these situations you have to ask yourself just how important that photo of the archway over the door really is. In my case, they pushed so I pushed back. They threatened to call the police, so I sat down on a bench and politely told them I’d wait. Everything worked out fine in the end, but it probably wasn’t my smartest move. Do as I say, not as I do. Photographing architecture can be a great way to hone your skills in a low-pressure setting. You can experiment with composition and natural light without worrying about your subject getting bored and walking out on you. Take advantage of the opportunity to push your creativity and grow as a photographer. As I told you - I'm still in process moving to my new apartment. But this day I was burned out a little bit, thats why I took doggie Mila and the Lensbaby Composer for a walk. And? I could not resist showing you a scene I really like. It's fascinating - sometimes I think my soul put his finger on the trigger, not me. And sometimes such shots are the result. I love life, I love so many things - but sometimes I'm looking for something more ... sometimes. English: Can't get no sleep - not yet. To much coffee? German: Schlafen geht gerade gar nicht, noch nicht. Zu viel Kaffee? English: I stood so long in front of this stoned angel, and I cannot believe yet that this beauty was made from stone. That's why I want show you her face, a face which has more truth and feeling than some living people I meet every day. German: Ich stand so lang vor dem steinernen Engel und kann immer noch nicht ganz glauben, dass dieser tatsÃ¤chlich aus Stein ist. Deswegen mÃ¶chte ich dieses wunderbare Gesicht zeigen, ein Gesicht das mehr Wahrheit und GefÃ¼hl in sich trÃ¤gt als viele Menschen die tÃ¤glich meinen Weg kreuzen. Wallpaper: If you are interested, this shot is as wallpaper available (resolutions included: 1920x1200 | 1280x1024 | iPhone/iPod Touch).